Ginger Honey Crystals make an instant beverage that has an exquisite smooth taste, appealing aroma, and contains antioxidants. Ginger is known to soothe an upset stomach, ease morning sickness and nausea, and assist with proper digestion. 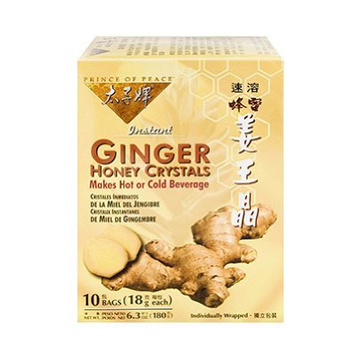 Make a hot or cold beverage with one Instant Ginger Honey Crystals bag. Each bag contains concentrated extract from 12 grams of raw ginger. Instantly soluble, convenient, and has no artificial additives. Combined with natural cane sugar and honey, you’ll love the natural sweet and spicy herbal flavor! One bag makes one beverage. Add 6-8 oz hot or cold water and stir. Feel free to adjust water levels according to your taste. Purchase Ginger Honey Crystals from our retail website, BabyHopes.com.